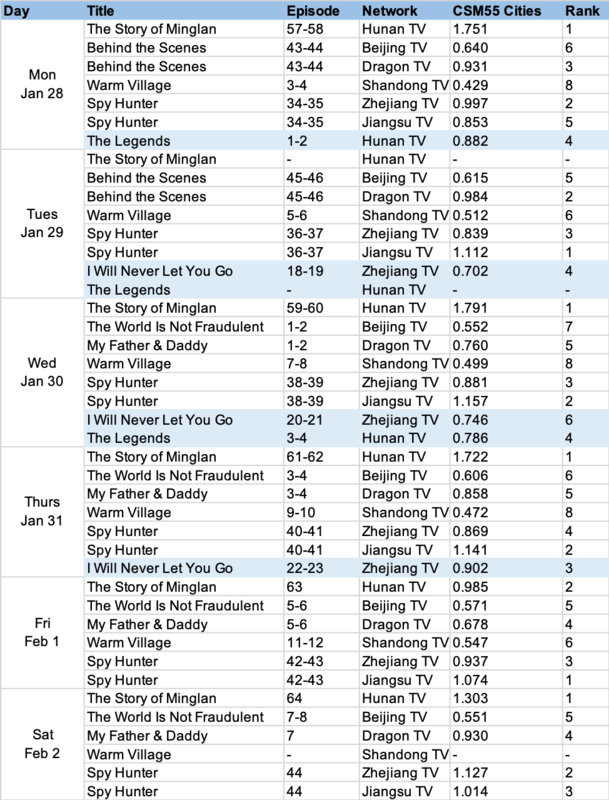 Spy Hunter had a great final week as it managed to stay consistently above 1% on Jiangsu TV and even broke 1% on Zhejiang TV so that both TV stations took 2nd and 3rd for the day just after The Story of Minglan. Minglan remains uncontested as the leading drama on TV and online with fluctuating numbers as high as 1.79% and as low as 0.99%. Behind the Scenes also aired its finale early in the week without much change in TV ratings though it did manage to make the top 10 dramas online. The Legends which just started airing also makes the list in 8th place. I'm personally more curious about Emperors & Me which jumped to 5th place. It's a web drama that takes time travel to another level with kings from different time periods ending up in the modern day. The Story of Minglan continues to lead nationwide with ratings above 1%. *The above are mostly primetime shows that air at 19:30 while those highlighted in blue air at 22:00. **Rankings are overall rankings across the shows airing on the same night, regardless of air time. *** Reruns are not included. **** Dramas that air on CCTV (the state television broadcaster in China) are not included. ***** CSM55Cities and CSMNationwide are common tv metrics. ******Missing data for Feb 3, 2019. I watched some eps of 'Emperoros and Me' on YouTube as the offical shannel has English subs. Even by webdrama standards it's pretty ridiculous but there's lots of handsome guys in it so maybe that's why it's appeared on the rankings. I'm surprised because I went to have a look at the weibo and there's hardly anyone posting so it didn't ssem like there was that much buzz. I am watching Candle in the tomb and it is great so far. Also watching I will never let you go but I have a feeling I might drop it halfway when it gets too angst. I actually want to watch the legends but alas no subs.